Cocktails in "the brig." An authentic sailing ship to scale. 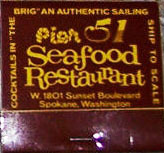 Pier 51 Seafood Restaurant and Lounge. 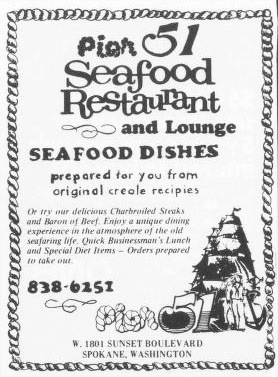 Seafood dishes prepare for you from original creole recipes. Or try our delicious charbroiled steaks and baron of beef. Enjoy a unique dining experience in the atmosphere of the old seafaring life. Quick businessman's lunch and special diet items - orders prepared to take out.